Creativity Humor Growth ☺CHG☺ Claudia H Gruy Writer's Burrow: Book Review: Rayne Hall "Writing Deep Point of View"
Book Review: Rayne Hall "Writing Deep Point of View"
Professional Techniques for Fiction Authors"
Writing in deep POV may sound easy and natural. After all this is what we – as beings – experience every day, don’t way? Right. And wrong at the same time. 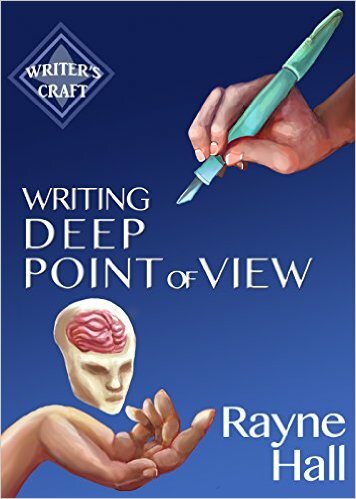 As writers we may THINK we apply that one person filter that we do on a daily basis in our personal life, alas the secret voices of imagination whispering our brains throw in the more than occasional rock. It hadn’t occurred to me how far I could stray from the truth until observant test-readers asked to put in a “he thought” and “he realized” here and there. I wrote in “deep POV” and therefore did not need those distancers? she enlightened me in a way no kind critter could have done. what better then to start “deep” and never have to wonder? Deep POV done right as explained in detailed steps by Rayne Hall gives you the tools to truly connect to your reader – or even better: the reader to your POV character. And with that the chance is there to submerge a reader into your story – and keep him rooted. And which books do we remember best? Those we lost ourselves in. to truly become part of the story – for however long it lasts!